Does PRTG provide native sensors for FortiGate firewalls? In my network I have a firewall from FortiGate. We're using the standard sensors in PRTG but this device's operation is very sensitive for my organization and we want to have additional monitoring so that we are alerted as soon as anything goes wrong. 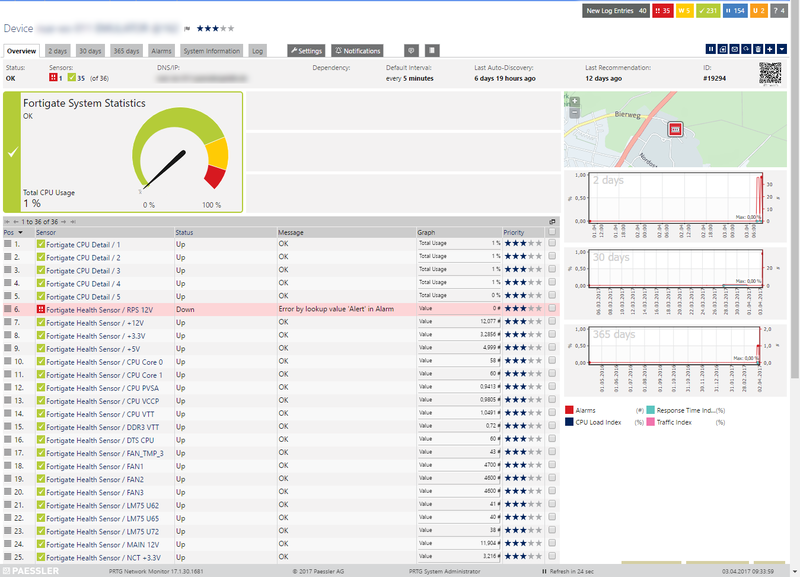 While PRTG provides a couple of sensors that work with FortiGate firewalls by default, for example the SNMP Traffic sensor and the SNMP System Uptime sensor, you may still be interested in more detailed sensors. FortiGate has a very extensive SNMP implementation which can lead to issues when you try to import or deploy a complete oidlib file and use the SNMP Library sensor. If you encounter this issue, please refer to PRTG hangs when adding SNMP library sensor. In this article we describe a different approach that does not use the oidlib, but you could still use it for other sensors. SNMP must be enabled and the device must support the FORTINET-FORTIGATE-MIB from FortiGate. Because of the way that the vendor implemented the MIB, the Health sensors do not provide a unit for the readings, but provide alerts since the sensors also evaluate the status of the fgHwSensorEntAlarmStatus for the corresponding entry. A non-clustered unit may cause alerts (Warning by lookup value 'Unsynchronized' in Sync Status) - You can either adjust the lookup or delete this sensor if you're not using a cluster. A non-installed, redundant power supply may be recognized as an issue or alarm. If your device does not have an RPS, you can either acknowledge or delete the sensor to stop this alert. VPN Tunnel: The template will produce one VPN Tunnel sensor per VPN x SA (Security Association). As a result you may see two or more entries for a single VPN. This happens because each VPN is listed as multiple entries in the fgVpnTunTable, distinguishable only by the fgVpnTunEntPhase2Name. To get an "Overall" status when there are multiple entries per VPN, please consider the Business Process Sensor. Here are a couple of examples: KB: How can I use the Business Process sensor? Right-click your new device, select Run Auto Discovery with Template, and select the Custom Fortigate Health v0.x from the list. Your auto-discovery log tells you a lot about what went wrong during the sensor's deployment. You can troubleshoot the auto-discovery by inspecting the auto-discovery log. If you get entries like the one below (NOT FOUND), it means that the required protocol or Object Identifier (OID) is not available. 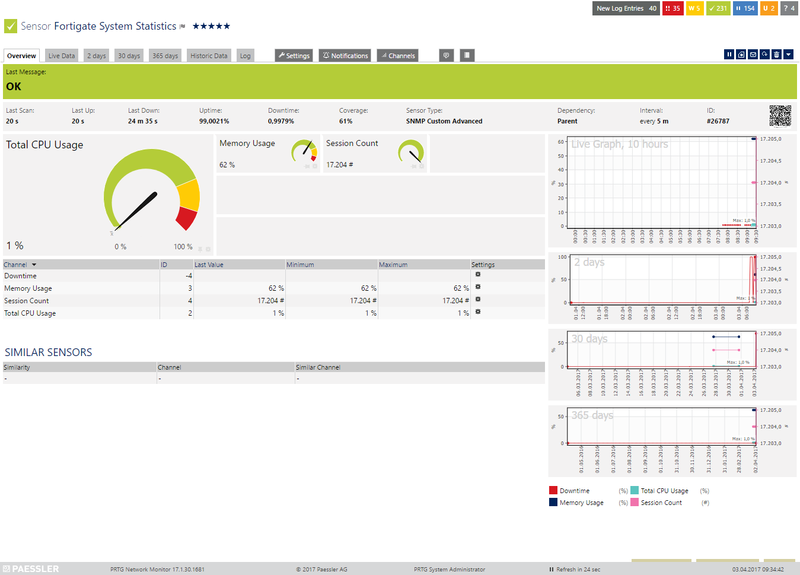 In the example above, some sensors were skipped because the device did not respond to the snmp_fgHwSensorTable check. This means that this data is probably not available on your device. You can track this data by looking for the name after snmp_. In this case, a search for fgHwSensorTable will tell you which OID from the MIB is missing. Very useful, thanks for this. Do you happen to have a template that works for Fortiweb device ? At the present time there is no Fortiweb specific template. However, depending on how Fortigate did this (If they've implemented the same FORTINET-FORTIGATE-MIB) the template above might work just as well. The template won't refuse to work if the device isn't a Fortigate. As long as the relevant metrics are present, sensors will be deployed (I assume that for instance the CPU and Hardware implementation might be common to the two devices). Just remember to enable SNMP before trying to use the template. You can also perform the test suggested in the Troubleshooting\SNMP Data section of the article to check if any data is available for the relevant OID's on your particular device (Fortiweb). Will you edit it to have the Performance SLAs instead of the link monitors? It's new with FortiOS 6.0.*. The oid walk is 1.3.6.1.4.1.12356.101.4.9. Thanks for letting us know! Could you provide what you specifically changed so we can adjust the guide above? It's pretty much like the link monitors but the name is different and the OID used is different too. I tried to edit it by myself but something doesn't work and I'm not sure how to troubleshoot it. Performances SLAs are like advanced link monitors and are used with SD-WAN. It's continuous checks to make sure the connection related to it is still reliable. I'm using a custom snmp table for now in PRTG but maybe with this it would be easier to configure in PRTG. The table oid used is 1.3.6.1.4.1.12356.101.4.9.1 for health checks (performance SLAs) instead of 1.3.6.1.4.1.12356.101.4.8.1 for the link monitors and the table name is fgvwlhealth check link.